*Remember if you use safety eyes to put them in before closing up the head. finish off, leave long tail for sewing. And that's it. I hope you get your Little Bigfoot bear made and I hope you love him or her just like I do! See the rest of my Little Bigfoot Collection listed on the right side of this page. So cute!! Thank you for sharing your patterns. you can highlight that link and open it from there I think! Thank you for these lovley patterns! I put a link to you blog under the picture. What you should do is make spongebob, patrick, mr. krabs, and squidward for my daughter she always watches that show. Thank you , Sharon, for sharing these lovely patterns with us. I have in mind to do some in special yarns - sparkly, variegated etc, and attach to key rings. I think they would look really nice like that. Would it make it difficult if using different plies of wool or thread? Hello! Thanks for the message... the only time I had trouble was trying to use a chenille yarn, I quit shortly after starting with it. I've made these guys with crochet thread and also acrylic thread and those worked out for me with a smaller hook of course. Sport weight yarn would work too! I've never worked with Sparkly yarn but I imagine that would work just fine. Thank you! I love love love this pattern! This passed weekend I watched your you tube videos on crocheting the Coraline doll. You do such beautiful work! I'm in awe at your ability! I've been out of work for quite a while so I've been on the hunt for free patterns. Pinterest has been a life saver for me, providing hours of enjoyment and it's only because of you and others who have such big hearts, that share your craft with the rest of us. I want to thank you for sharing your wonderful patterns. Thank you so much for the awesome message Karen, I'm really happy to hear that! I am always so touched to read messages like yours, it's like fuel in the gas tank for me!! Karen, I too have been laid off for almost 5 years and I donate a many things for Babies in NCIU and Hats for the Children in the Neighborhood as well as Cupcakes for the events for Children. I look for free patterns too. This year I'm hoping to donate some toys and Hats to Homeless Shelter for Children. Thank You Sharon for all your help and God Bless you for having such a big heart because we all benefit from your generosity. awesome patterns!!!! quick and easy to read thank you for sharing!! 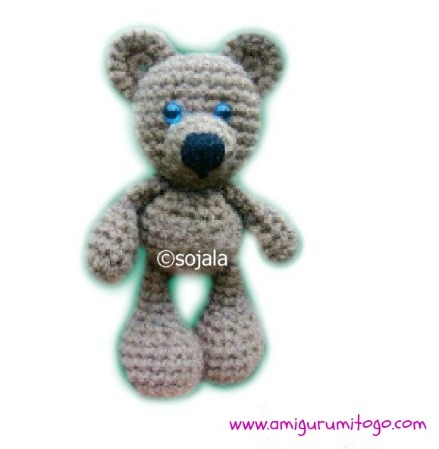 I love the bear, Thanks v.much for the pattern, it will keep me busy during this horrible weather here in Scotland. I love the site also. You're very welcome! I'm glad you found the pattern and will enjoy it. Happy to hear from you, I hope your weather gets better! Crazy...at one point I thought the body was really the head and visa versa, so that is how I made my bear. The ears seemed way too big so I did another crazy thing. I did not look at the pictures. Now I see where I made changes. It is a great pattern. Easy to use and learned how to deal with shapes. Love the Pattern can you tell me where you got the eyes in the tutorial photos They ar perfect for this and another project I want to make. Hi there, the oval white eyes are called character eyes and I got those in a thrift store. The small blue ones are from a site online called "Animal Eyes- Lisa & Ed's Eyes and More"
I've ordered from that site a few times now and they are awesome, s/h is great too. Hope that helps!